Celeriac is one of those veggies I don't see often on supermarket shelves, and when I do see one I fall on it like a starving wolf. It's particularly delicious raw, and is lovely in salads. 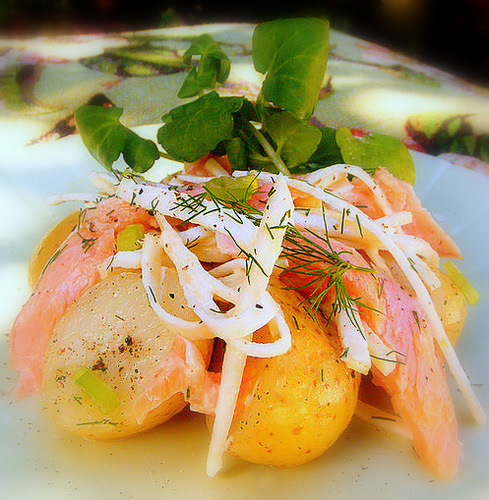 I made this salad today using the beautiful piece of smoked trout from Harty's that I bought yesterday at the Cape Town Food and Wine Show, and what a winning combination: the smoked trout is beautifully offset by the earthy crunch of celeriac matchsticks tossed in in a remoulade-style dressing of crème fraîche, lemon and a little horseradish. If you can't find watercress - in my opinion a hugely underrated salad ingredient - use any small green leaf, but avoid rocket, which will overpower the delicate flavour of the trout. Boil the potatoes in plenty of salted water for about 15 minutes, or until they are just tender. In the meantime, make the dressing. Put all the dressing ingredients in a large bowl and whisk lightly until combined. Season with salt and pepper. Peel the celeriac (use a knife to cut off any knobbly bits, and then a potato peeler to remove the rest of the skin). Cut vertically into thin discs (this is easiest using a mandolin). Now stack the discs in a pile, six at a time, and cut into matchsticks. Add the celeriac to the bowl (do so immediately, to prevent it from browning) containing the dressing, and toss well to combine. Drain the potatoes and cut them in half. Put them back in the pan, add the olive oil, season with salt and pepper and toss well. Arrange the warm potatoes, in a circle, in a large flat platter. Sprinkle with the spring onions. Tip the dressed celeriac into the middle of the salad platter. Pull the smoked trout into chevron-shaped pieces or big shreds and pile on top of the celeriac. Tuck sprigs of watercress all the way round the the edge of the potatoes. Serve immediately. Note: don't leave the celeriac strips to languish in their dressing for more than about 30 minutes, or they will lose their snappy celery taste. Like this? Try my Roast Beef Fillet with Creamy Celeriac and Horseradish Cream Salad. I have never cooked with celriac before - will have to give it a try! That's odd about watercress; a while back the local British press were whingeing about the stuff being flown in from Portugal and...South Africa! Slagella: now that is odd. You do get watercress here, but not much of it. It's all flown to England, evidently! I've been seeing crunchy celeriac salads pop up all over - seems like I'm going to have to give it a try one of these days! I saw daikon the other day in Spar - is it related at all to celeriac? It was also a big knobbly root (much bigger than I thought it would be to be honest). I only know of daikon pickles (as used in Japanese cuisine) - any idea what else to use it for? Will now keep my eyes peeled for celeriac in Spar - you never know - they are getter very chichi in our neck of the woods these days!